Because you cannot update Google Play services through the Play store, you need manually install the latest version of Play services using APK files. Some Google apps require the latest Play services. You can find all Google apps APK files in APKMirror. As in the previous guide, I showed you how to sideload Chrome browser to Amazon Fire tablet (Amazon Fire HD, Fire HDX and Kindle Fire HDX). But when you use this method for other Google apps, e.g. GMail, you will find that these Google apps do not work. This is because more and more Google apps require some other Google components and sometimes require a Google account as well. Of Course, Amazon is trying to remove these components or is not licensed to use these components. So, there is no official way to add a Google account on Amazon Fire tablet. This guide will show you how to set up a Google account on Amazon Fire tablet, and how to use Google accounts on Amazon Fire tablet. Fire tablet in this guide refers to Fire HD, Fire HDX and Kindle Fire HDX. For the older generations of the Kindle Fire tablet, it may also work similarly. What do you need to set up a Google account on Amazon Fire tablet? 1. Sideload 4 Google apps: Google Account Manager, Google Services Framework, Google Play Store and Google Play services. Among these 4 apps, only Google Play services can be sideloaded from 1Mobile market. The other 3 must be installed through APK files. 2. ADB access to your Fire tablet. You need a developer environment on your PC and run one ADB command. Root is NOT required. 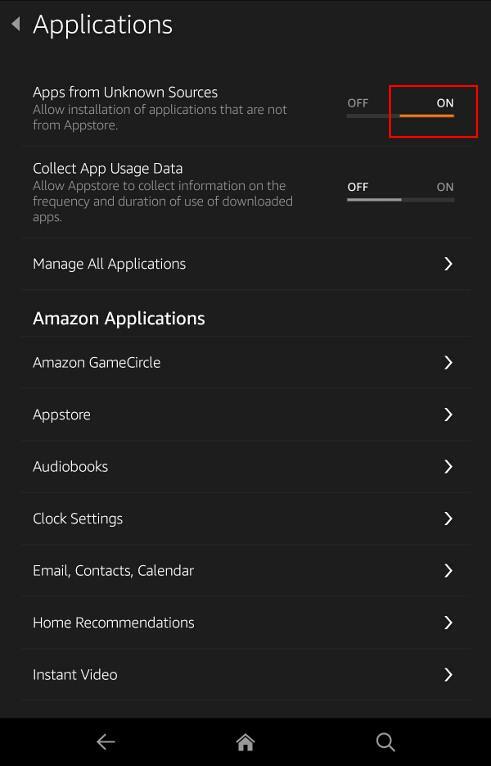 As you need to install some apps that are not from Amazon Appstore, Apps from unknown sources must be enabled. In Settings—Applications, tap On for Apps from Unknown Sources. For the first 3 apps, the detailed step-by-step installation procedure is covered in this guide. I will not repeat them here. After downloading the Google Account Manager APK file to your Amazon Fire tablet, you can install it immediately as shown below. After reviewing the permissions, tap Install to install Google Account Manager to your Fire tablet. Please note, if you try to add your Google account now, you will get the Couldn’t sign in error as shown below. This is due to some app permission problems on Fire tablet, not related to your Google account. So we need run an ADB command. To run any ADB commands, you need to enable USB debugging on your Fire tablet. 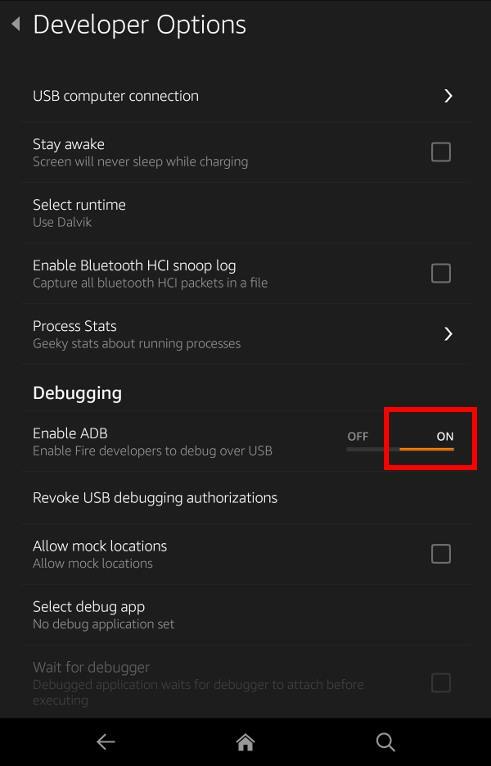 To enable USB debugging (enable ADB), you need to enable Developer options. Please refer to this guide on how to access developer options and enable USB debugging as shown below. 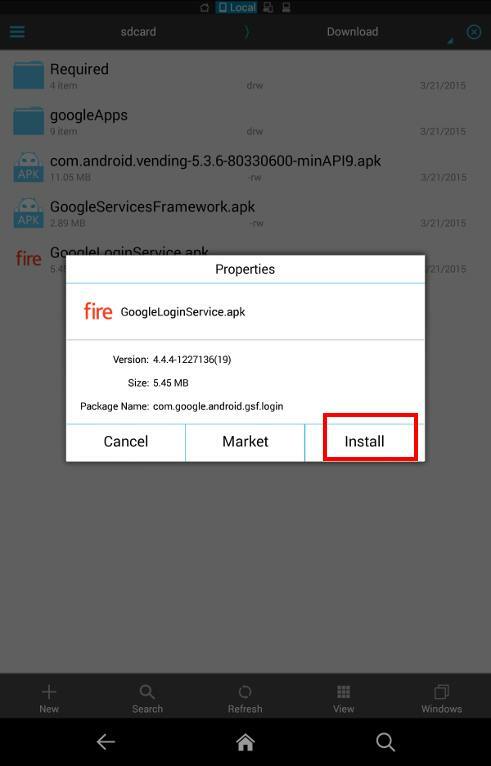 On the PC, you need install Amazon Fire ADB driver and install Android SDK. Please follow this official guide for this. Now connect your Amazon Fire tablet to the PC with USB cable. 1. cd to the folder where adb.exe is located. For my PC, it is located in C:\apps\adt-bundle-windows-x86_64-20140321\sdk\platform-tools because I used the old zip package and unzipped it to apps folder. On your PC, the folder name should be different. The output of this command should be the serial number of your Fire tablet. There should be no output or errors. 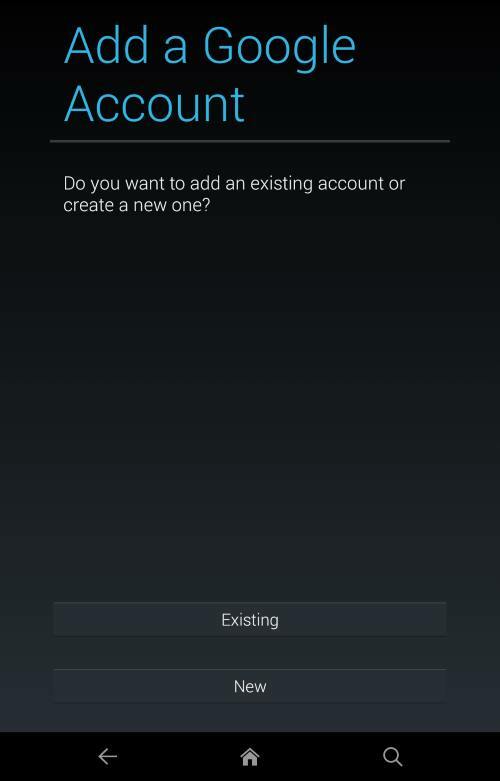 Step 5: Add a Google account. Now, you can install GMail app or any apps to add a Google account to Amazon Fire tablet. Follow the Add a Google account page to add an existing Google account or create a new Google account. How to use Google apps on Amazon Fire tablet? You can install almost all Google Apps from the 1Mobile market. Most Google apps work nicely on Amazon Fire tablet. I tested GMail, Google Play Movies & TV, Google Play music, Google Play Books, YouTube, Google Maps, Google Drive. All work without issues so far. Please note, this method cannot make Google Play Store app work on Amazon Fire tablet. 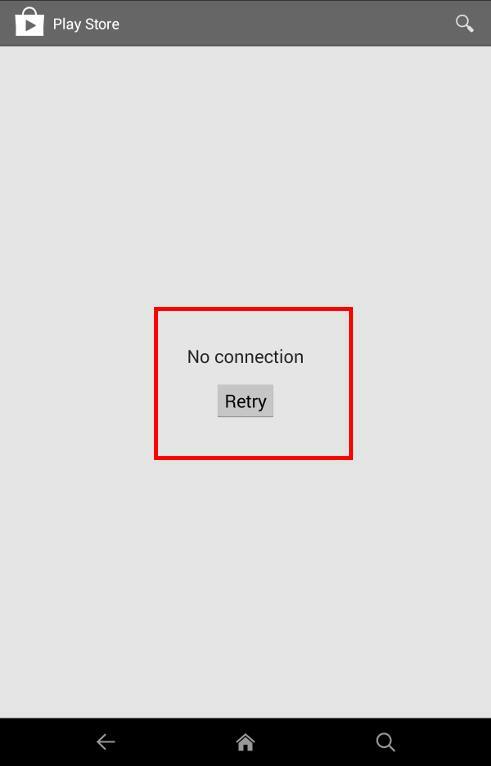 Although you can set up Google Play store with your Google account, the main store is always loaded as No connection as shown below. As you can always install apps from 1Mobile Market, this probably is not a big issue. Can you set up a Google account on Amazon Fire tablet now? If you encounter any problems to set up a Google account on Amazon Fire tablet or having any questions on how to set up a Google account on Amazon Fire tablet, please let us know in the comment box below. Thanks for the info, but this is very frustrating. The SDK manager in Android Studio doesn’t install everything it needs to to make this happen. Amazon should just make this happen natively. Boooo. any problems to follow this guide? Yes, the last step of running the ADB command works fine, but I still receive an error communicating with google servers. Is there a way to debug this or know what permissions each app requires? I got the same error, same situation as yours. Is there an alternative. The command did not give any error, it just executed, but google account still says the same error. Did you run the adb command successfully? Same here. Everything went according to plan, but same error about not connecting to the server. I’m using a Fire Kids edition. Glad to know it. Enjoy your tablet. Simon, the last step executes without error and I in fact dont see the error it said earlier after the access was granted. However it displays the same error again. Any ideas? Never mind, I made it to work with a few changes in steps. # Download and install the 4 google apps as mentioned, and for each install, reboot the tab. # Follow instructions as mentioend for enabling ADB and granting permissions, then reboot tab again. # Install any google related app, e.g. youtube, and open it. It will say “google play services need to be updated”. at this time, proceed to update, when it will finally set up your google account. After the above, it will automatically pick up the google account for any google app. Everything works, the youtube, google photos, google+, google hangouts, etc. Thank you for sharing your solution to make Google account work on fire tablets. I think Amazon broke it again. Despite going through all of this my Google apps don’t appear to have online access. A pretty big problem for something like Gmail. Weirdly it did appear to accept my login. It’s just unable to retrieve any messages or even my avatar. Did you try to reboot the tablet? – SDK’s for Kindle not available for API17 or any other Android ver. Spent over two hours loading all the apps/files …no result. You should get the latest SDK. You need enable usb debugging on the tablet. – I confirmed “Enable ADB” … is “ON”. ADB devices command works but does not detect. Is Kindle doing something else to prevent detection? Or is it that my PC or Kindle don’t wish to cooperate? Thanks alot. I just wanted to use google play music and couldn’t add an account but couldn’t figure out why. Now everything works! Maybe your guide in Step 4 how to install Amazon Fire ADB driver and install Android SDK needs an update?! Not from Chrome browser. Follow the guide and try to add it from play store or Gmail or YouTube. When I run the command, “adb shell pm grant com.google.android.gms android.permission.INTERACT_ACROSS_USERS”, it returns “Error: Unknown command ‘grant'”. I have a Kindle Fire HD 8.9, system version 8.5.1_user_5158820. Can you list the device on the command prompt? I’m having this problem as well, everything before this step works perfectly, but when I input the “adb shell pm grant…..” command it says grant is an unknown command and presents a usage list for pm. Is your tablet listed when using adb devices command? not sure. But it seems probably the console package manager (pm) may have some issues in your tablet. I am having the same problem. i enter the command ‘adb shell grant…’, and receive the error ‘unknown command ‘grant”. The question is – how can I rectify the problem? What if I have root, is there a more effecient method to install? First of all, thank you! This seems to be the only guide on the web that enables Google apps without rooting. I followed this guide with some difficulty (and help from Google) and got to the point where Google Play Services is working. My account was recognized when I added it from Keep, and 2-step-authentication seemed to work at first, but then there was an error message (along the lines of) that authentication failed. None of the Google apps are working except services, which lists my account and lets me manage some settings. Could it be that I need to use an app-specific password in order to authenticate? I’d like to try but I couldn’t figure out how to re-add my account or even get a new chance to type in my password. I have to disable 2-step authentication to make it work. I haven’t found a solution for it yet. I’m not qualified for giving legal advise. But as I know, there are no illegal activities/operation involved. No luck. I get a notification that Google Play services is the wrong architecture. Any remedies? Thanks! It means you got the wrong apk file. Try to use the apk file link in the post. It has finally been updated on 1mobile app. Anyone get hung up on a ‘Signing in…’ page? I only have Google Music and Google hangouts installed, and it only hangs up on hangouts. Google music seems to run fine. This is normal for hangouts. I assume there is no fix for this at this time? There are no easy solutions. Google and Amazon are working in opposite directions. More and more Google Apps get deeper integration through Google play services and newer android APIs. But amazon is trying harder to de-Google on FireOS. Amazon is probably on the wrong direction as far as FireOS is concerned. I am unable to get the SDK Manager to list the Kindle Fire Device Definitions or the Amazon AVD Launcher, it only lists the USB drive… I have used both the listed tutorials for setting up SDK but no luck getting those to show up in the list for extras. Are there any other places/urls that can be added to give these? Same problem, followed everything. used the second amazon guide too. I followed everything I could find, though could never get it to find the device, however, I did get everything to work. Installing Google Play and then logging into Google seems to allow everything to work and have had no issues with Google apps. This was the difference between other similar walkthroughs. I am not able to get this to work. I installed all the apps and ran the adb command without error, but when I attempt to add the google account for the gmail app (or any google app), I end up with “error communicating with google servers”, which is what I thought the adb command fixes. Help? Thank you in advance. Long story short, I reset it, attempted to do what I did before and was not able to get logged into my Google account. I reset a couple more times, thinking I had messed something up, trying both the new version and the older version of Google Play Services and it still does not work. With the old version, it says it needs the update to Google Play Services to work when I try to use GMail to log into my account, with the new version, it just says it cannot communicate with Google servers. I know I.did see a message asking me to confirm the adb connection one time. I’m having same issues, but adb is working fine for me. I think its working… I used the older Services but without installing 1Mobile at all, using APKs I found online to get this running first, will try to install/use 1Mobile once everything seems to be working. FYI: The problem I was having with getting adb to work… apparently the SDK manager did not actually install the driver on my PC? I went to its location and installed the file and then everything worked. Updated Google Play Services and everything that worked before, still works. Google Drive and YouTube (which did not work before) now work, but Keep, Sheets, Docs, and Photos still do not work. Great guide, but ran into an issue and could use some help. -d: filter to only show disbled packages. pm list permission-groups: prints all known permission groups. -f: list the .apk file for the test package. pm list features: prints all features of the system. pm path: print the path to the .apk of the given PACKAGE. -l: install the package with FORWARD_LOCK. -t: allow test .apks to be installed. -i: specify the installer package name. -s: install package on sdcard. -f: install package on internal flash. pm clear: deletes all data associated with a package. of a given package or component (written as “package/class”). pm get-install-location: returns the current install location. pm set-install-location: changes the default install location. applications to break and other undersireable behavior. And of course I can run the “pm” commands natively from the shell as well, but I still get the same error as above. Agreed, that the package manager may have some issue, but the question is what kind of issues and how can I correct them? Is there anything I can provide you that may answer these questions? Everything works to the point I have to use the command prompt to list adb devices. I get the response: adb is not an internal or external command. My device manager lists the device as ADB Interface. Thanks for the guide. I am considering buying one of the new Fire tablets. I searched for the Google Music app in the Amazon App Store, and no dice. That’s a dealbreaker for me. 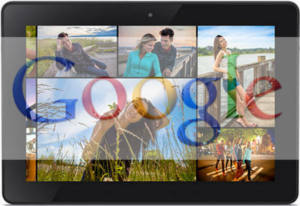 If there’s a way to sideload the account and app, the tablet becomes much more attractive. Fire tablet is best for Amazon prime members. It becomes harder and harder to get Google contents to Fire tablets. Anyone have any luck with google contacts sync? New Kindle Fire 5th generation. This worked like a charm!. Many, many, many thanks, now mi Kindle fire is just perfect!. Thank you so much for sharing those apks. I actually used them on my Chinese Xiaomi android phone and everything is working like a dream! Thank you! Hey thanks for this. I just got the Fire Phone.. awesome price. Now I am on 4.6.5.. the newest. All I did was install you files you gave.. signed in. Never did it once say error.. The ADB DEVICES command returns the ID of my Kindle Fire 7 HD (2nd Version) however it doesn’t produce a popup on the Kindle, and the ‘pm grant’ functionality seems to be missing from the shell. I think this is because they have removed the Device Definitions for the kindles. I tried setting it up manually but it makes no difference to making the popup work. It seems Amazon removed some packages that are not supposed to be used in fire tablets. 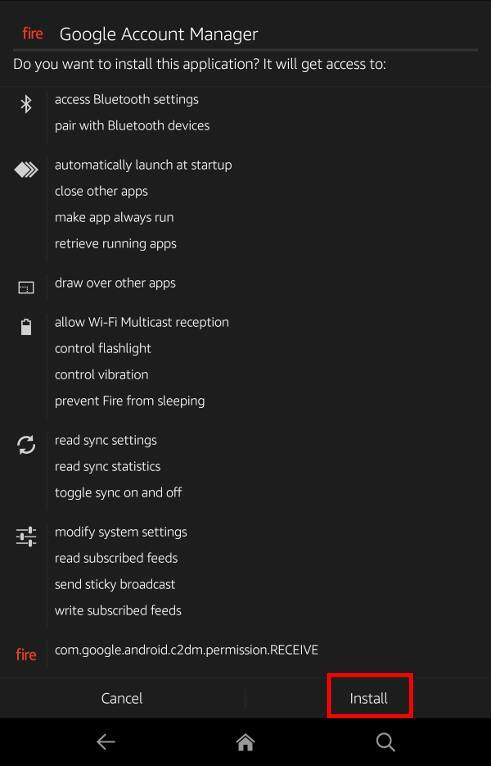 I don’t understand what the end result is after all these steps are executed if Google is in fact filtering out Kindle serial numbers which blocks the device from being recognized as an eligible android device and furthermore what specific apps are compatible with the device based on google filters? Google doesn’t block devices. Google wants more users of their apps to get more traffic so that they can sell more ads. It’s amazon who wants to build a walled garden with their own services. And they purposely block Google services. This is why they can sell fire tablet with very low profit margin (sometimes even below cost). Amazon need make money from their services. So the Android SDK is going to make it possible for google play to accept and recognize the device into an existing google account? No, Google has no issues with fire tablet. And the problem has no issue with Android SDK. You can add Amazon developer tools in Android studio without issues. It seems Amazon removed some packages on the fire OS that affects Google Play services. It seems Fire phone is not affected. But some tablets are affected. I followed this and for the most part it seems to work (I was able to get Galaxy on Fire 2 HD apk off of the google store and sideload it). 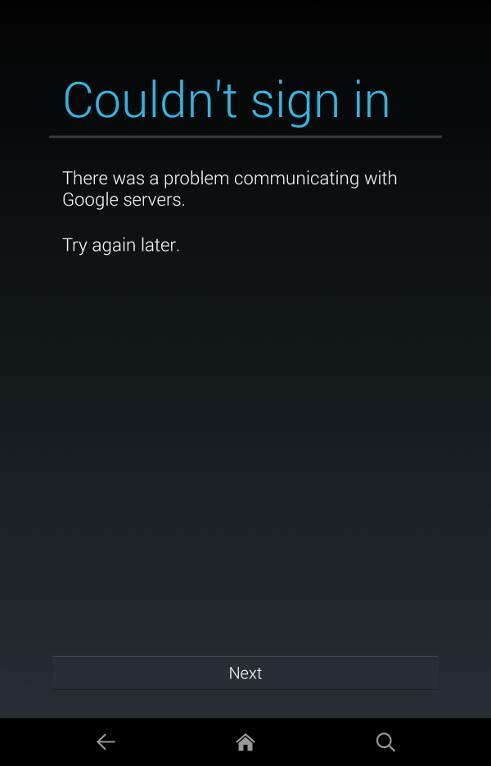 My issue is that all the Google apps seem to throw an error “Unknown issue with Google play services”. I can’t connect to Google Play, Gmail opens however never loads anything and if I attempt to sync it either sits there for a very long time “spinning” or throws the aforementioned error. Any idea what I did wrong (aside from buy the tablet before checking more forums lol)? You cannot access play store directly, and some Google services. There are no easy solutions because Amazon aggressively removed any possible holes for Google services. Amazon wants you to stay within their system so that they can sell the tablet at razor thin profit margin, sometimes, even below cost. Thank you for this guide. I tried to follow your steps, but I didn’t get it working yet. The youtube app loads, but when I try to add an account, it doesn’t go to the add account screen. Same with Play books. Yay, it works now! First, I had forgotten to install google accounts apk, which is why the login screen didn’t show. The easiest way to not forget anything the second time around was to just use the dropbox folder with all four apks provided by you. I had to update the Play services app through 1Mobile store to make youtube work, and now it all works like a charm. One small idea for improvement: I would have appreciated a warning at beginning of article that this takes about 2-4 hours if you factor in installation of the Android SDK and a a couple of trial and errors. Overall, I am very happy with your instructions. Thank you! While I am logged into google now it seems (It shows my name in top left corner in apps), I get error messages in nearly all apps. In Play Music, I get the error “Sorry, we were unable to connect to the server to add the account. Please try again later from Settings. When I try to add another gmail account now, it gives me the error, “Couldn’t sign in. There was a problem communicating with Google servers. Please try again later.. I didn’t get an error when I put in ADB command, but I did notice that some of the Kindle Fire SDK packages werent available when seeting up the Android SDK. What’s the fire OS version on your tablet? If any version of these apk files works, don’t update them. Anyway, don’t expect play music, movies or books to work on fire tablet. They are DRMed. Not sure. I actually tested it 4.5.1, and it still works on 4.5.5. But as mentioned, Play music, movies and books do not work. I am now testing it on Fire OS 5. Too much & very detailed info. was very happy to try it out, took two days to download & setup everything but after running commands it seemed that everything is good & I may try to add my google account now but the same communication error is still there. I am using Fire phone with OS 4.6.6 Model # SD4930UR. Does the AT&T matters?? because I have an App pre-installed name myAT&T. Not sure because I never test it on fire phone. I got everything up and running but when I try to add my google account I get a ‘Couldn’t sign in’ error saying ‘There was a problem communicating with Google servers. Please try again later.’ I have tried multiple times with different accounts and I keep getting the same error. Any ideas? Thanks for the helpful advice. I bought a kindle fire hd 6 for my 5 year old son and really wanted the youtube kids app on it. After a few version conflicts got resolved between the yt kids app and google play services, it works. Is there a way to get google play working on it without a computer? I think you need a PC to run adb commands. Also Google play works only on the 5th generation of fire tablet. I have setup everything and I have two of my gmail accounts working within the gmail app. One has 2-step auth and the other does not. While trying to add the third account it just fails. when I click on manage accounts it takes me to the settings screen but there isn’t any place to manage the google accounts on the device. Since this is a Fire 7 the only account option is for the Fire. Am I missing something? How do I remove a google account or manage the ones I have? Amazon removed all Google services from fire tablets, and there are no account manager for Google account. You need add Google account inside any Google apps. You need tap as account inside any Google apps. You should NOT use manage account, which does not have a corresponding entry in Settings in any Amazon tablets. Is it possible to perform this on a mac? Yes, adb commands can also run from Mac. You need download the package. Play store only works on the 5th gen (latest) fire tablet. For all previous generation Kindle fire tablets, Play store does not work. When you run the two adb commands, did you get any error messages? You can try to reboot the tablet to see whether it helps. I have no idea where the Debugging mode is. The deeper I dig, the most I become. I just do not know what the various details mean. * I have Windows 10, which seems to do NOTHING the same as prior versions of Windows. I had never succeeded with this particular guide on my 4th gen Kindle Fire HD 6, like several other commenters here. Then I found this http://forum.xda-developers.com/amazon-fire/general/installing-google-framework-playstore-t3216122 and it worked flawlessly. Note it seems to require Fire OS 5, furthermore the description says it works on 5th gen devices only, but it worked like a charm on my 4th gen Kindle Fire (bought in 2015). Other redeeming quality: It’s dead easy if you’ve already tried this guide, and it also removes the ads in the same sweep. By “working flawlessly” I mean the full package: Google Accounts, Play Store, and all the Google apps I have tried, excepting Inbox, which works in principle but misbehaves to where it is impractical to use. I’m hoping updates may fix it in the future. Nevertheless, I appreciate what Simon has done here given how many people were clearly helped by his efforts. Keep it up! After hours and hours of following instructions from all related sites, and numerous reboots, all Google apps including Gmail, YT work except Play. Two hours after I gave up I tried to download an app from Play and it just works. Guess it could take a long time for Services to connect. Thanks! Really helpful! Now I have the Google Play Store on my 2015 Fire! I did not even need to hook it up to my PC. 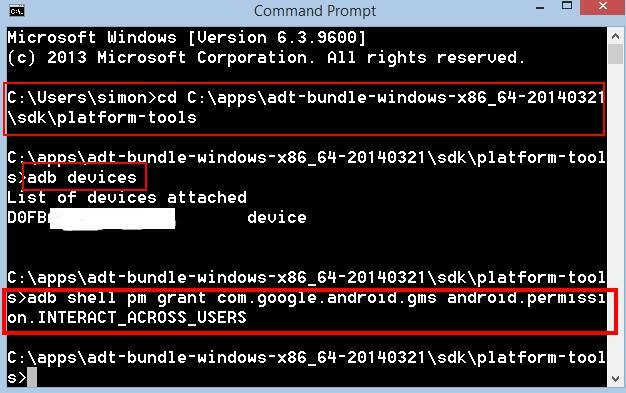 I thought the adb command is part of the Android sdk, why would it say it is an unknown command for some of us if we are all running the same version of Android sdk? The command is to be run on the fire tablet. Some required packages were removed by Amazon in some batches. Step 4 above says to run the adb command from a CMD promt on the PC. I ran the first step and I get the Kindle serial number. But when I run the abd command to grant permission to google play services, that is when it says “grant” is not a command. How do you run the abd command on the kindle? There is no DOS window. I think that “grant” command will only be there if the correct Kindle Fire system images are installed, unfortunately some of the ones for the older Kindles are no longer shipped. I’m not sure about how to log out of an account once all is said and done. Iv successfully ran played and installed apps but I have purchesd games on another account and cannot figure out how to log into that account from google play since I don’t have google settings? You can add more Google accounts in Gmail app. So, I don’t know where I’m going wrong, but I ran the command prompt, everything looks like it came out ok as far ad the ADB goes… But I still get the issue in communicating with the servers. Anyone got some ideas? If ADB commands can run successfully, you can reboot the table and try again. You can open Gmail app and check again. What’s the fire OS version? It seems Google services work better in fire OS 5. In fire OS 4, there are many different problems due to some missing packages. It’s OS 5.1. Anyway, I did check it again and I’m in. This is an excellent guide! Make sure to install all 4 of the apps before you try to run the adb commands. Follow the official guides for getting adb to recognize your device – this took a bit to figure out. This allowed me to get google play (music, store, gmail, etc) to work without root – awesome! In the 5th gen Fire tablet, you can find Apps from unknown sources under Settings – security. Has anyone tried this on the fire stick? Any reasons to run Google services in such a TV stick? cd is just a DOS/Linux/UNIX command for you to change (c) directory (d). Is there any way to remove a google account once it is added to the amazon tablet. I was able to install the google play store with one account and later added another account that already had apps I wanted, but now I cant get rid of the first account. Thanks. Your need remove all Google accounts to remove the first Google account in the fire tablet. In Google’s term, the first Google account on the device is the main account. You can only remove it after you remove all other Google accounts. My 5th Gem Fire doesn’t even HAVE the “Apps from unknown sources” tab/item. All I wanted to do is install Instagram. UGH!!! For 5th Gen, apps from unknown sources option is under Settings– Security. What if I install the 4 apk files and setup a google account on my fire kindle, then how could I add another google account? After entering the given link in the Android SDK Manager, I don’t see the Kindle Device Definitions kit. I just see the Kindle USB driver. I’ve tried restarting the SDK Manager, but no go. You don’t need it. Amazon dropped the emulator 2 or 3 years ago. What error did you get? Can you use Google drive with your first Gmail account? Hello, I have Kindle Fire 3rd Gen running 4.5.5.2. I have performed the 4 apk file installs and the ADB command successfully. Then I performed update of Google Play services via 1Mobile software. Note: Doing update thru an app like GMAIL will fail because it brings up Google Play Store that only gives the RH-01 error. At one time I was actually able to get GMAIL application to work, but other apps would fail. So I removed everything and tried again. Now it is worse. Google Play Services keeps crashing. So my question is this: Can you tell me the correct versions of each piece of software that should work with each other without Google Play Services crashing? I think it’s important to make sure I have the right architecture version and maybe some other pieces. It would be a shame to toss out this decent tablet. if it works, you should not update such apps and services. It is hard to make Google services work on Fire OS 4 because Amazon was trying hard to make it impossible to run them at that time. It is a bit easier in Fire OS 5. Can you list your fire tablet with ADB command? Since Google updated the chromecast (cast) app to Google Home, has anyone got this working? I get the Home app to open, click sign in, and then it crashes back to the home screen. The latest Google Home app works on Fire OS 5. You should sign on from Gmail app. Google assistant should not work. I downloaded and installed these apks on my Kindle fire GR8 (6TH gen). The only problem I am having is with location services. The Fire OS 5.3.3.3.0 is in conflict with Google services. The Location Services in the Fire IS settings now refuses to turn on. Is there any way around this??? Not sure about the issue. Did you try to reboot the tablet? Rebooted several times. Same message pops up and trying to turn location services on lasts for about half a minute before then off and message pops up again. After reboot and message pops up, don’t let you turn location on at all, only right after reboot and doesn’t stay on. Error resovled. I downloaded Google maps and it asked me to turn on Google location services, message no longer comes up and location based services in kindle is now turned on. I assume if BOTH are not turned on, neither will work and you get messages. Message simply said Location based services is not turned on, please turn on Location Services in settings. Was a kindle message, not google. Which is why I had the problem, I kept going into kindle setting to try to turn it on and kindle wasn’t the problem. Thanks for the replies, maybe this will help someone else in the future. I would make sure location based services in kindle (settings/wireless/Location-Based services) are on prior to downloading and installing the Google apks, then if message pops up, go into Google settings and turn on Location Services in Google. Thank you for sharing the update. I got my account on chrome, but when I click on it to sign in and click continue nothing happens. Is there something else I need to do? You need the Google login services. If your tablet is running Fire OS 5, then it’s easy to install it.